We at Kortgleder desided to have a lifting-our-followers-project! Everyone chose their favorite to lift one of works. I chose Linda or Scratch to lift this time. She is one very talented and creative scrapper so just pop into her blog and say hello to her! I bet you will find some inspiration there! 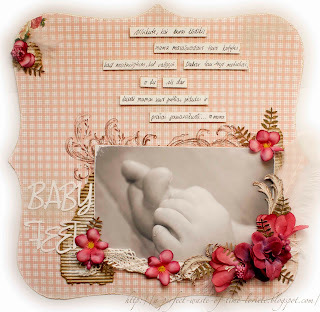 Here is my creation LO "Baby Feet"
Beautiful layout! What a sweet little picture! Kjempe lekker! Skjønner godt at du valgte henne. Hun er fantastisk, både som scrapper og menneske!